The minute I walked into Monte De Oro Winery, I looked at my husband and said, “We should have a party here.” Open 1 ½ years ago, this winery is owned by 67 families (investors) throughout the U.S., England and South Africa. What makes this winery special is their glass floor in the middle of the tasting room. 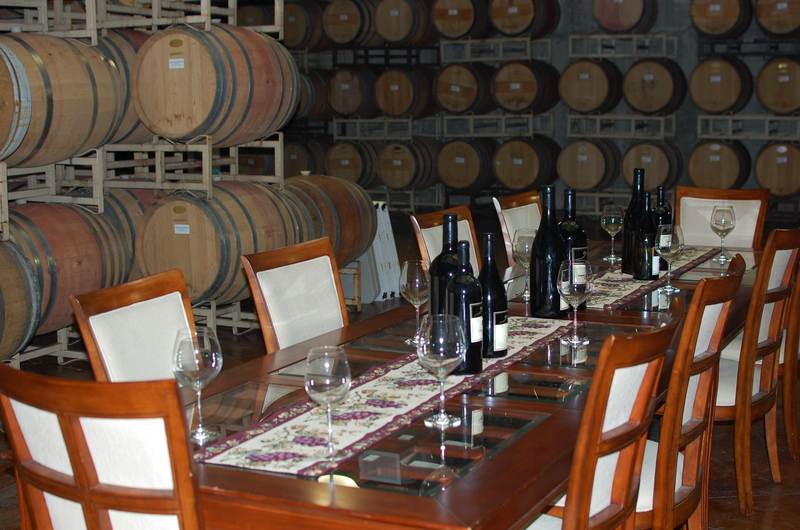 Looking through the glass is their barrel storage room and a table set in the middle for an intimate dinner party. We were lucky to get a tour of the downstairs room with French oak barrels. It’s also an area where visitors can rent for parties, receptions, and private barrel tastings. All the barrels are labled with dates and grape varietals. The red wines are barrel-aged for almost two years. Then the wine is bottled and “rests” for another six-months before released. This allows the wine’s complexity and depth to shine. A more refined taste then the wines that are sold in the store. Those are newer wines that are more fruity and tart. When you allow a wine to “rest”, it compliments food by enhancing flavors. This winery offers great entertainment throughout the summer. Missing Persons and the Romantics are performing on August 20, 2011. Go to www.montedeoro.com 35820 Rancho California Rd. Temecula (951)491-6551.